Plascon Nuroof Cool has a unique formulation called Enviroshield™. This is a giant leap forward in green technology which combines performance with visual splendor and saves cost. This exterior paint is a low sheen finish with a spread rate of 6 m2/ℓ (Spread rate may differ due to the condition of the surface being painted). Plascon Nuroof Cool is available in 16 colours. 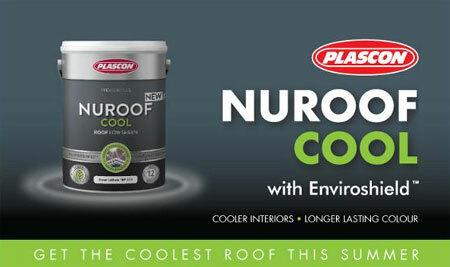 Plascon Nuroof Cool is a premium quality UV-resistant water-based acrylic roof coating, perfect for exterior use. Can be used on galvanized roofs (corrugated & IBR), asbestos & fibre-cement roofs (both smooth tiles and profiled sheets). Can be used on roofs with granular tiles (stone chip, sand and unpainted cement tiles). Can be used on cladding, galvanized garage doors, down pipes and gutters. Highly UV-resistant & extremely durable as a weather resistant coating. Cools the interior of your home by up to 8%. Comes with a 12 year Product Quality Guarantee. Easy application by brush, roller or airless spray. Leads to energy saving (reduced need for cooling). The coating has a minimum TSR (Total Solar Reflectance) of 30%. Nuroof Cool should not be diluted, it is ready for use as is and is available in 5 ℓ & 20 ℓ. All surfaces must be clean and completely dry before painting the surface.